(Nanowerk News) Electrical charges not only move through wires, they also travel along lengths of DNA, the molecule of life. The property is known as charge transport. 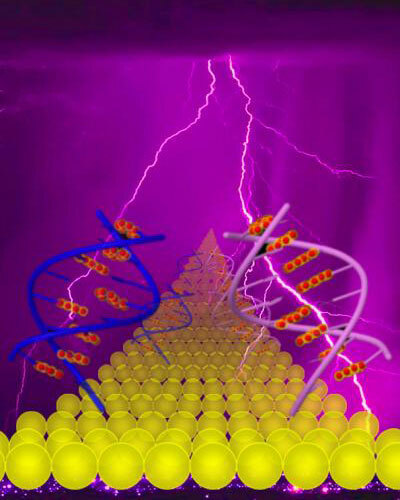 In a new study appearing in the journal Nature Chemistry ("Intermediate tunnelling–hopping regime in DNA charge transport"), authors, Limin Xiang, Julio Palma, Christopher Bruot and others at Arizona State University's Biodesign Institute, explore the ways in which electrical charges move along DNA bases affixed to a pair of electrodes. Their work reveals a new mechanism of charge transport that differs from the two recognized patterns in which charge either tunnels or hops along bases of the DNA chain. Researchers predict that foundational work of this kind will have important implications in the design of a new generation of functional DNA-based electronic devices as well as providing new insights into health risks associated with transport-related damage to DNA. Oxidative damage is believed to play a role in the initiation and progression of cancer. It is also implicated in neurodegenerative disorders like Alzheimer's, Huntington's disease and Parkinson's disease and a range of other human afflictions. The work was carried out under the direction of Nongjian (NJ) Tao, who directs Biodesign's Center for Bioelectronics and Biosensors, in collaboration with Vladimiro Mujica at Arizona State University, and Mark Ratner at Northwestern University. The transfer of electrons is often regarded as the simplest form of chemical reaction, but nevertheless plays a critical role in a broad range of life-sustaining processes, including respiration and photosynthesis. Charge transport can also produce negative effects on living systems, particularly through the process of oxidative stress, which causes damage to DNA and has been invoked in a broad range of diseases. In some cases, the DNA damage is repaired when an electron migrates from another portion of the DNA strand to replace the missing one. DNA repair is a ceaseless, ongoing process, though a gradual loss of repair efficiency over time is one factor in the aging process. Oxidation randomly damages both RNA and DNA, which can interfere with normal cellular metabolism. Radiation damage is also an issue for semiconductor devices, Tao notes--a factor that must be accounted for when electronics are exposed to high-energy particles like X rays, as in applications designed for outer space. Researchers like Xiang and Tao hope to better understand charge transport through DNA, and the molecule provides a unique testing ground for observation. The length of a DNA molecule and its sequence of 4 nucleotides A, T, C and G can be readily modified and studies have shown that both alterations have an effect on how electrical charge moves through the molecule. When the loss of an electron or oxidation occurs in DNA bases, a hole is left in place of the electron. This hole carries a positive charge, which can move along the DNA length under the influence of an electrical or magnetic field, just as an electron would. The movement of these positively charged holes along a stretch of DNA is the focus of the current study. The research is part of a multi-institute project carried out under the Department of Defense's Multidisciplinary University Research Initiatives (MURI) Program--an initiative aimed at promoting "high priority topics and opportunities that intersect more than one traditional technical discipline." Biodesign's experimental efforts are being supplemented with new theoretical investigations by project collaborators, including David Beratan at Duke University, and Mark Ratner at Northwestern University, who have devoted considerable effort to developing theories of charge transport in macromolecules. Two primary mechanisms of charge transport have been examined in detail in previous research. Over short distances, an electron displays the properties of a wave, permitting it to pass straight through a DNA molecule. This process is a quantum mechanical effect known as tunneling. Charge transport in DNA (and other molecules) over longer distances involves the process of hopping. When a charge hops from point to point along the DNA segment, it behaves classically and loses its wavelike properties. The electrical resistance is seen to increases exponentially during tunneling behavior and linearly, during hopping. By attaching electrodes to the two ends of a DNA molecule, the researchers were able to monitor the passage of charge through the molecule, observing something new: "What we found in this particular paper is that there is an intermediate behavior," Tao says. "It's not exactly hopping because the electron still displays some of the wave properties." Instead, the holes observed in certain sequences of DNA are delocalized, spread over several base pairs. The effect is neither a linear nor exponential increase in electrical resistance but a periodic oscillation. The phenomenon was shown to be highly sequence dependent, with stacked base pairs of guanine-cytosine causing the observed oscillation. Control experiments where G bases alternated, rather than occurring in a sequential stack, showed a linear increase in resistance with molecular length, in agreement with conventional hopping behavior. A further property of DNA is also of importance in considering charge transport. The molecule at room temperature is not like a wire in a conventional electronic device, but rather is a highly dynamic structure, that writhes and fluctuates. The contribution of this DNA molecular movement to charge transport behavior is only beginning to be investigated and will be one focus of the ASU researchers' ongoing efforts.